Fresh from an 1890s privy and one I've never seen nor heard of. Perhaps some on the blog would have some info ? Not bad for a 90s bottle !! 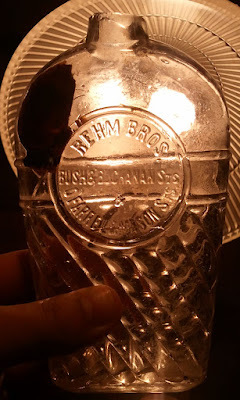 Some research has found that Rehm Brothers operated from 1891-1900. A. Fenkhausen "One Name Bear"
Here is your average decent example of a "One Name Bear". At first observation is appears the same as any other example in color, top, and embossing. The examples I have seen all have the multiple "rivet patch/ repairs" to the mold, especially on the reverse. Take a look at this one though...it only has a small square shaped repair area on the lower reverse. I have not seen this before, and there are no other signs of the typical mold patches commonly found on this bottle. I looked at my "Two Name Bear", and it has a crude irregular spot in the exact location, but not a nicely defined square patch. Is this common on this bottle? I know there are many versions of the "Bear" so perhaps I have simply missed this on other examples. It just seems odd that this area is irregular on the earlier "Two Name Bear" and cleaned up on the later version. I know it is not strength of embossing as the rest of the bottle is well struck. 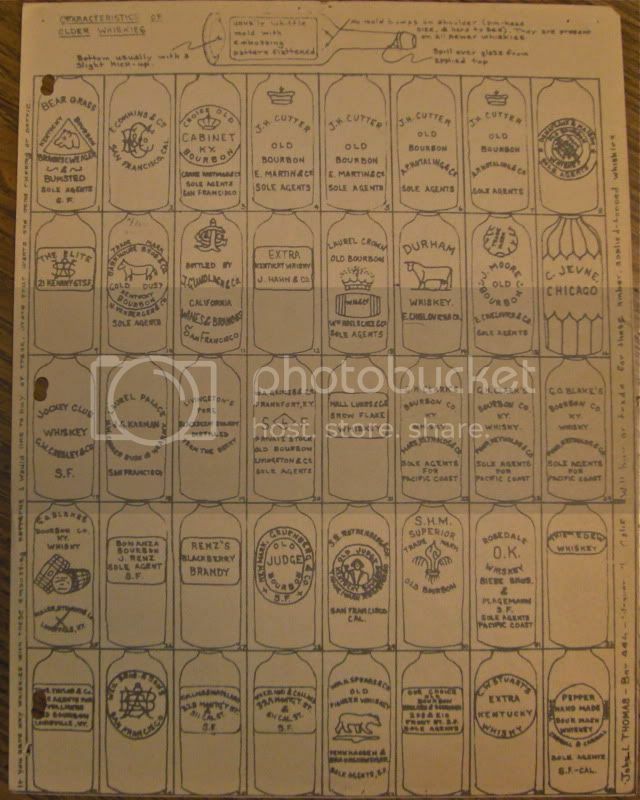 How many of you recall John Thomas's first list with the original line drawings and his contact information on the outside edges? For some unknown reason this was stuck in the pages of one of my old copies of Bill and Betty Wilson's "Spirits Bottles Of The Old West. Sort of an interesting footnote to whiskey collecting history. Here are a few more photos of our bottle steak fry the other day. This group of fifths are a portion of the Glen and Read G. collection. They have concentrated on 'color runs' for the most part. We used the other display to show off the T-43 Circles, so many great bottles were hidden away in boxes before I got the camera out. The 19 Circles from the last post belong to Glen & Read, Blake P., and yours truly. The S.T. Suits bottle was dug a few years ago, it is mint and the last example of this rare fifth to surface. The Circles are already starting to replace a few bottles I wish I would have clicked. The bros. have the finest set of Martin Mid Crown fifths I have seen, including a superb green example. Also a killer set of W.A. Gaines fifths. The winner is..... the one in the center. Jewels, whittle, tall mold, tied for greenest in color. Dug about 15 years ago. More of these goofy Reynold's Herb Beers. I'm the one that is goofy. I should have been trying to get some of these together when they were available. They are a scarce bottle and most of these are now concentrated in three collections here in Utah. They were blown approx. 1886-1888. The bottles change colors all afternoon in the natural light. Looking at the 4 on the bottom right... the one on the far right, 2nd from right, 4th from right.. all dug in Ut. and in different locations... east, west, south. They are all the "tall mold", the bodies are about 3/16" taller from the base to the mold seam above the circle. Reds and yellows really stand out at sunset. A few green ones have been found in UT. We have Jewels... second from right. All across the top of the crown on this beauty. Check out the top on this GII-65 half pint! This is the Westford Glass Co. rather than the much more commonly seen Willington version. I have seen some knarly crude applied tops on western blown bottles, but here is evidence that the teenagers in Westford , Connecticut must have flunked "Top Applying Class". While not from the West, this is a great example of why we love glass! 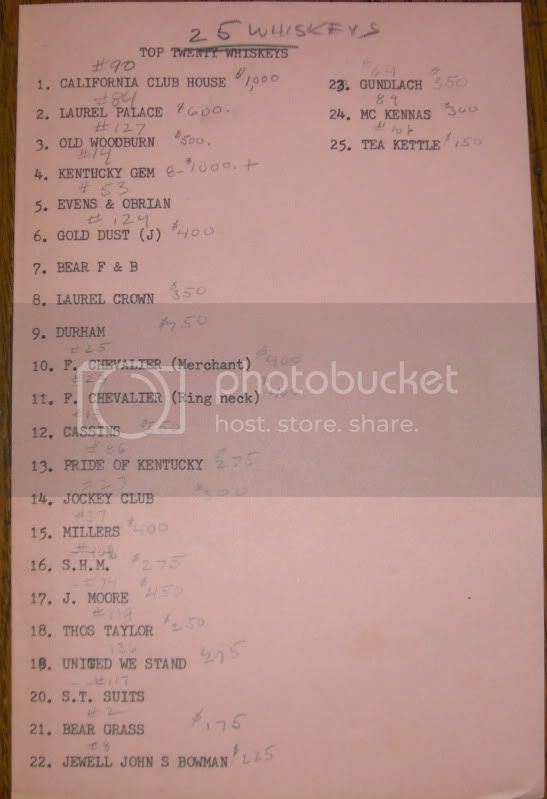 I was futsin' around looking for a particular bottle book when I stumbled on John Thomas's original 1969 book and found this 1970s sales list of the old Top 25 Western Whiskeys. I'd sure like to be able to grab a few at those long gone prices.